May 2008 AOM: Quantum Philosophy and the Ancient Mystery School, Today’s New Science Philosophy – Old or New? 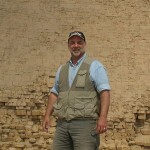 Edward F. Malkowski, our author of the month for May 2008, has a lifelong interest in history, particularly ancient history with a special interest in philosophy and the development of religious beliefs from ancient to modern times. With the opinion that the ancient biblical stories in Genesis were based on historical fact, during the late 1990’s he began investigating such a possibility which led to his first book Sons of God – Daughters of Men. This led to a deep interest in the origin of civilization, the curiously large monuments of Egypt’s Old Kingdom, particularly the Sphinx, and the influence Egyptian philosophy and culture exerted in the ancient world. Two more books were the result: Before The Pharaohs and The Spiritual Technology of Ancient Egypt. Malkowski, whose professional background is finance and business administration, is also a software developer with interests in business strategy and philosophy as it relates to the advancement of technology. He will be available on our Author of the Month Message Board throughout May 2008 to discuss his work and to respond to comments and queries from posters. Responsible for the microelectronic technology that brought us the cell phone, the computer, and the Internet, quantum physics has proven to be history’s most successful scientific theory. Quantum physics is also the source of a new understanding of the world around us. Although the founding principles of quantum physics were developed in the 1920’s and 30’s, it wasn’t until the 1970’s that its influence seeped into our cultural worldview. In 1975, with the endorsement from one of quantum physics creators, Nobel Prize laureate Werner Heisenberg, Fritjof Capra explored the similarities between quantum physics and the Eastern mystical tradition in The Tao of Physics. Another landmark book was published four years later. Gary Zukav’s The Dancing Wu Li Masters: An Overview of the New Physics. With these books, and many others that followed a new worldview begun to emerge embracing the interconnectedness between Man and Nature. Everything is connected through a universal field of virtual particles, and we are all part of a single living system. What this new worldview suggests is that physical form as biological consciousness is a local expression of a universal phenomenon commonly referred to as ‘Consciousness.’ The cycle of life and the evolution of form are natural processes that create a framework for experience where consciousness is a fundamental aspect of reality just as much as the spatial dimensions. Consciousness, once thought to be only the product of brain chemistry, is now viewed as the eternal driving force for all that exists, and through physical form, manifests itself in order to experience. Although Mind is very much an enigmatic and highly debatable concept, this new worldview also suggests that the individual’s mind is a process of this universal phenomenon to experience as opposed to being a separate entity. Another creator of quantum physics and Nobel laureate, Erwin Schrödinger, views this problem between one Mind and many minds as an arithmetical problem. For Schrödinger our perception is scientifically indescribable because the mind is itself that world picture. Thus, the individual mind is identical to the whole ‘Mind’ and therefore cannot be contained in it as a part of it. This creates a problem, because there is a multitude of individuals experiencing consciousness but there is only one world. One answer to this paradox is that each of us experiences a unique world, which Schrödinger summarily dismisses. There is only one other alternative. The multiplicity of minds is only apparent, in truth there is only a single Mind. Such a concept brings with it complex ramifications for the definition and nature of knowledge. You might think that since quantum physics is a relatively new branch of science this burgeoning ‘New Science’ philosophy is also new. It is not. These new insights into nature and reality are very old but have been masked by modern attempts to characterize the ancient Egyptian culture and religion as primitive. The concepts of Mind and Consciousness, as well as reincarnation and evolution, were expressed long ago in what historians have labeled the Ancient Mystery School – what Schwaller de Lubicz termed sacred science. Although shrouded by the secrecy of the temple and rites of initiation, ancient Egyptian schools taught this secret wisdom through myth and symbolism, an approach that leads to an understanding of the world that is virtually identical to today’s New Science philosophy. Leaving behind modern biases and looking deep into ancient Egypt’s civilization there is brilliance and understanding that rivals our knowledge today. Their ‘gods’ were of a different order from our Western concept of God. They were not gods at all, but principles of nature that represented such concepts as digestion and respiration. They also represented intangible qualities found in mankind such as knowledge and personality. This ancient view of nature has been mistaken as religious and cult-like, but is, in fact, technical and philosophical. For example, the king’s diadem with its serpent and vulture symbolized the principles of life and form. The serpent represented the concept of the Source for all that exists and its manifestation as the cosmos; and the vulture, man’s spiritual immortality. Like a spirit, the vulture, soaring high in the sky, escapes this world to an existence beyond the bounds of Earth. Thus, Pharaoh’s diadem symbolized Man’s Kingship in a cosmic sense and the mystery of life’s essence, where the mystery is the reality of Cause and Effect. This mystery, which defines the human experience is abstract, but operates through the concrete court of three dimensions to create another abstraction – what we experience as consciousness and self-perception. How the ancient Egyptians developed such a refined philosophy is a mystery in itself. For scholars such as Samuel Mercer, who translated Sakkara’s “Pyramid Texts” during the 1950’s, the tenets of this philosophy appear to have emerged fully-fledged nearly 5,000 years ago without a historical precedent. It is ironic that ancient Egypt’s technical capabilities, so ambitious, so precise, also appear to have emerged fully-fledged without precedent. Although, we shouldn’t be surprised, since the development of a sophisticated philosophy does not occur without sophisticated technology. Such insight into ancient Egypt’s earliest traditions moistens the seeds of doubt for history’s linear model of Man and Civilization. Particularly so when today’s emerging ‘New Science’ philosophy parallels concepts described long ago in Ramses’ Temple of Amun-Mut-Khonsu, so meticulously described by Schwaller de Lubicz in his two volume work The Temple of Man. In 1937, alchemist and Hermetic philosopher, René A. Schwaller de Lubicz was drawn to Egypt by an inscription at the tomb of Ramses where the Pharaoh was depicted as the side of a right (3:4:5) triangle. For Schwaller de Lubicz, this meant that the ancient Egyptians understood geometry’s Pythagorean Theorem long before Pythagoras was born. So, intrigued, he moved to Luxor and studied ancient Egypt’s art and architecture for thirteen years, and concluded that the temple architecture was a deliberate exercise in proportion. The temple, with its detail, described as a science the nature of Man, a philosophy that Schwaller de Lubicz termed the Anthropocosm, or the Man Cosmos. Who we are and why we are here, the ultimate mystery, will likely remain a scientific mystery. Intuitively, however, this mystery can be understood upon the realization that our existence as a conscious biological form can be traced to cosmic events, and that the prerequisites for our existence can be traced to a universal state. Our Earth is dependent on the sun and the solar system in which it is gravitationally trapped; which is dependent on the Milky Way Galaxy, in which it is gravitationally trapped; which is also held in place by other forces including, but not limited to, our neighboring galaxies. Any interruption in this line of cosmic dependency would likely result in the cessation of our existence. Thus, it can be said that the cosmos is the true nature of Man, and form is the sole means of its expression. The most interesting question is, where does our ability to observe and perceive come from? According to physicists, it comes from an event called ‘state vector collapse’ where all possible states of the system (the universe) collapse into a single observed state. During the 1920s, while Heisenberg and Bohr were further developing quantum theory, they realized that a new viewpoint had to be created to achieve a proper understanding of the quantum world. The classical view of a discrete world would simply not work. To accomplish this, they embraced the idea that the world is fundamentally not a collection of discrete objects, but an indistinct, unified world of energy where, at times, discrete objects are perceived. Heisenberg developed his wave matrix theory, and Schrödinger his wave mechanics, to explain their insights. Although slightly different in their approach, these two theories offered a more accurate description of the atomic structure than did classical physics. What their theories state is that all matter exists as a wave structure that we cannot directly see. What we do see is the localization of the wave structure with its release of energy, which is a simple way to explain state vector collapse. The energy released is what physicists call a photon (a particle of light). We perceive the released energy as a particle, even though it is really a wave. This occurs for us because that is how the human brain works. Without state vector collapse there would be no perception of separation, no form to experience and, consequently, no expression. The cosmos would remain in an undefined state of absoluteness, a potential of all cosmic possibilities. All matter that makes up the cosmos is actually configured energy that now exists as a result of stellar nucleosynthesis and supernova. Carbon, nitrogen, oxygen, and other heavy elements-the building blocks of life-were created as a result of large stars collapsing under their own weight and then exploding with tremendous heat, spreading newly created elements into empty space to form interstellar clouds. New research suggests that even amino acids, important for protein synthesis, were formed in interstellar clouds. Thus, scientists argue that since the elements that make up our bodies are the results of a cosmic process, then we are made from stardust and are literally children of the stars. The Big Bang origin of the universe has been the model of choice for cosmologists for many decades now, but it has always been a scientific paradox. Our known laws of physics are not valid until after the moment of the Big Bang. So, how do we arrive at a universe that we experience, which sprang from nothing? Perhaps the Big Bang is only a perspective to explain the current body of scientific data, and does not accurately represent actual events. As is all of nature, perhaps the universe is cyclical and oscillates between the never-ending destruction and creation of galaxies. No one really knows. However, what we do know and can be certain of is our conscious experience. It is the one thing all six billion of us can agree upon, and the key to understanding nature. According to the Anthropocosm, Consciousness creates a venue in order to experience, and does so through the unique quantification of its qualities. This cosmic and anthropic ‘New Science’ understanding of Man puts forth the same principles that were built into the architecture of Luxor’s Temple of Amun-Mut-Khonsu. The Uroboros, however, is not just an ancient mythical symbol, nor is it the fabricated imagery of the primitive mind. Rather, it is Man’s identification with the seamless, eternal state of oneness whose essence is a deep memory of an origin that words cannot explain and has to be understood through esoterism. As such, the Uroboros’s esoterism is as valid today as it was at the dawn of Man, as physicist Joel Primack and his wife, Nancy Ellen Abrams, demonstrate in The View from the Center of the Universe, a modern cosmological treatise in which the Uroboros is portrayed as representing the quantum unity of all that exists within the vast dimensions of the cosmic scale. Spirit is not some immeasurable, metaphysical thing. Rather, spirit is the driving force behind the human experience, the quest for knowledge, and the building power of civilization that can be measured by achievement. Technology is mankind’s application of knowledge into industry which provides for the civilization’s wellbeing. Technology, which is the application of science into civil practicalities, is also the building power of civilization. Even though technology’s final product is most evident, it is the spirit of Man that turns ideas into concepts, and concepts into knowledge, which through engineering brilliance, turns science into technology and makes life more efficient and comfortable. Every product ever made began with someone’s inspiration and creativity. So, spirit and technology are really different aspects of the same human endeavor. The desire to know inspires us, and the ever increasing level of knowledge and technology has allowed us to reach new depths in understanding our state of existence. But what might have inspired the ancient Egyptians? Schwaller de Lubicz believed that ancient Egypt was the legacy of a technical civilization for which there is no history or knowledge of in today’s world, a civilization for which spirit and technology were integrated into a worldview that embraced life’s mystery. For me, it is this technical and spiritual legacy that is so evident in the art and culture of ancient Egypt. The Spiritual Technology of Ancient Egypt expounds upon the works of Schwaller de Lubicz and tells the untold story behind the birth of the western religious tradition. The Egyptian Mysteries, as they were called, inspired the greatness in men who instilled the concept of the Anthropocosm into our own sacred literature, and it is the same philosophical understanding of Nature that is at the forefront of today’s New Science; whether symbolized by the Uroboros or Schrödinger’s wave equation, human consciousness exists as a local manifestation of a self-perceiving Universe.